This year’s Women’s Open Elite was clearly the toughest in NACBAIT history, as there were 6 hard working teams who had a good shot to take it all. Even the 2 young teams in the division made the more experienced teams work for everything they got, as they each had single digit losses in pool play. By the time Monday had rolled around, we went from 10 playoff teams to only 4 in a real struggle for supremacy. The first Semifinal game was the undefeated SF ArcAngels (2002 champions) and the LA Aiya (2001, 2003, 2004 Champions). San Francisco had looked great all tournament long, as they had been an unstoppable scoring machine. Meanwhile, Aiya was priming themselves for another deep run as they were pacing themselves for a long tournament. They had suffered a minor setback with a loss to Toronto in Pool Play, but were still feeling great about their chances. LA began with balanced scoring as 6 players made their mark in the first half. SG Jessica Liang was absolutely in a zone as she hit 2 threes and sank a couple more that were only a couple inches inside the line. With ArcAngel speed demon Kathleen Ty (2 points, 3 boards, 4 fouls) in foul trouble, and Kelly Tiao (10 pts, 7 rebs, 2 steals) outnumbered on the boards, this proved to be a difficult matchup for San Fran. LA continued to stretch the lead, before finally advancing 52-34. To their credit, the ArcAngels refused to give up, and played hard up to the very last second. The second game was a rematch of last year’s Championship game, as SF Red Coach (2005 Champs) and Toronto CCYAA A (2006 Champs) met up again. In last year’s game, Red Coach could not find their range against the Toronto defense. Toronto played their brand of ball again this time, with Cecilia Chan (5 steals), Janice Lui (3 steals) and Christine Vuong (2 steal, 3 assists) ballhawking Red Coach and causing 10 additional turnovers. On the Toronto offensive end, their steady guard play resulted in only 5 turnovers, so you might think CCYAA would have an easy time once again. But SF Red Coach came up with a great plan. The new gameplan was to hit the offensive boards hard. Red Coach outrebounded Toronto 32-21, with a lot of that boardwork happening on second chance opportunities. Red Coach held a 6 point halftime lead, and held on for a 3 point win, 35-32. Guard Angie Wong paced Red Coach with 8 points and 7 rebounds, while Kim Lee had 16 pts, 3 rebounds, and 2 assists for CCYAA. The Finals worked out to be LA Aiya and SF Red Coach meeting up for the National Championship, just as they had done in Chicago 2005. The game looked to be an even matchup, with both teams coming in with 1 tough loss in pool play, and identical 4-1 records. Red Coach was looking great at halftime, as they held a 17-13 lead over Aiya. But LA evened it up at 17 with 18 minutes left to play. Both teams were playing excellent defense and LA held a 25-21 cushion with 9:30 to go. But Red Coach started to turn the momentum their way over the next few minutes as they began to dominate the glass and Angie Wong hit a couple tough jumpers. They were up 30-29 at the 2 minute mark. Seconds later, All-NACBAIT selection Kristen Welsh hit the second of 2 ft’s to tie it up at 30. Darlene Yee then drove the lane hard and was fouled by Aiya’s Alice Wang. She earned a trip to the line but missed both with 1:19 to go. SF fouled Alice and she sank two for a 32-30 lead with 1:17 remaining. Red Coach had a good look for a layup inside but missed, then had 2 more chances on offensive rebounds but the ball kept bouncing out. Alice Wang stepped it up, got her little body into the fray, and came out with the ball. She then swished 2 more for a 34-30 lead with 52 seconds. Red Coach came down the court, and Alice made another steal with 33 second left. She got the rock to Jessica Liang who then hit 1 of 2 at the line. SF Red Coach missed 2 desperation attempts and Kristen Welsh gathered in the rebound and sank 2 more freebies for LA with 8 seconds to play. San Francisco could only manage to score 1 bucket and the clock ran out. LA Aiya 37, SF Red Coach 32 in a well played game from both teams. 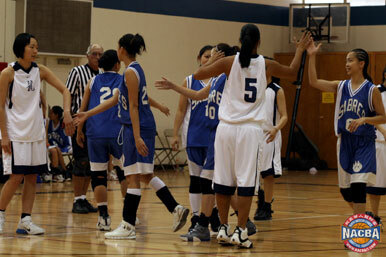 SF was led by Kim Hong’s 8 rebounds, and got 8 points apiece from Cassie Chi and rookie Angie Wong. Kristen Welsh paced LA with 13 points, 7 rebounds, and 2 steals. MVP was sister Allison Welsh, as she had a fantastic tournament and dropped in 5 points, 4 rebounds, and 2 assists for the title game. Congratulations to LA Aiya on their 4th NACBAIT Title.